Berberine-containing plants are used medicinally in virtually all traditional medical systems, and have a history of usage in Ayurvedic (Hindu) and Chinese medicine dating back at least 3,000 years. Suggested Usage: As a dietary supplement, take 1-2 capsules each time, two times a day, or as suggested by a healthcare provider. Sensitive individuals may want to take with food. 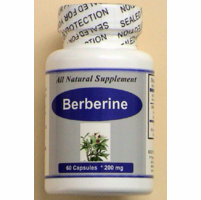 Berberine has demonstrated significant antimicrobial activity against bacteria, fungi, yeast, protozoans (Giardia, etc. ), viruses, helminths (worms) and chlamydia. In addition, berberine's actions include: antagonism of the effects of cholera and E. coli toxin, inhibition of intestinal ion secretion, inhibition of smooth muscle contraction (spasms), and reduction of inflammation. Berberine's most common clinical uses include: bacterial diarrhea and intestinal parasites. Berberine is effective in firming the stool, but can loosen obstructions as well, while eradicating toxins in the lower tract, useful when treating diarrhea while preventing dehydration. Amongst other uses, this herbal derivative has the capacity of reducing feverish-nervousness (febrifuge) via the calming and consolidation of the system. Berberine appears to offer anti-infective qualities, actually inhibiting the adhesion of disease cells (bacteria, fungi, parasites, etc.) to the body's host cells, thus crippling the disease cell before it can do any damage. It does this by causing the disease cell to lose lipoteinchoic acid (LTA) which is the major substance responsible for the adhesion of bacteria (and other disease cells) to host tissues.